Here we have a printed tile mural proposal to accompany a very modern church structure. What ceramic and pottery adornments outside church buildings have we to look to for inspiration? Very striking examples can be found in Italy, and date from the 15th Century: the glazed terracotta works of Luca della Robbia. With the gentle, classically posed figures and compositions, glazed in palettes usually limited to two to five colors, the tableaus sit well with tradition and yet are bold and easy to read from a distance. I felt that referencing clay ware for porcelain tile work was apropo. Plus, employing the European technique of trompe l'oeil, and having the pop art movement of the 1960’s somewhere in my mind (since the church that stands today was erected in the 1950’s, with windows made within the next few decades) – it all came together. Christ, God and the Holy spirit as being sun-like. To the right is the starry sky, with the Star of Bethlehem shining brightly. Across the top, starting from the corner of the Eye of God (Have you heard the saying “when you were just a twinkle in your father’s eye”?) are seven spheres = the seven days of creation. Each is divided into more sections, and the sphere’s increase in size, alluding to a human embryo developing, and traveling through the Fallopian tube. White roses - Mary’s purity. Easter lilies – In early Christian art, the Angel Gabriel offers pure white lilies to the Virgin Mary, and this symbolizes that she will be the mother of Jesus. Purity; hope; life; Easter. Daffodils = Eternal life; the resurrection. Egg and dart motif in the frame = It is a pattern that has been in use from Ancient Greek times, through the Renaissance and to the present day. It is a classical design celebrating life and death; the life cycle. 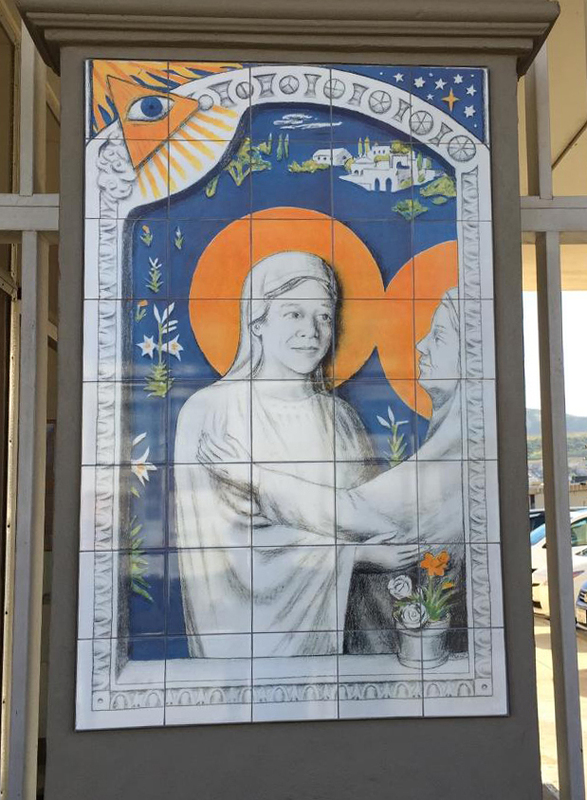 The tiles are made of very durable porcelain, kiln-fired at 1,800 degrees, able to withstand the elements for decades to come, and were created by Tile Mural Creative Arts tilemuralcreativearts.com, out of Calabasas, CA. They make the tiles featured in the Monastery Icons catalog. Amid the blood, sweat and tears, working on this image has been a true blessing. Thank you, Fr. Thuan!